This weekend you can ride a Routemaster for free as more than 100 Iconic Routemaster Buses gather in Central London for the Routemaster Diamond Jubilee Celebration. More than 130 are booked to appear at the event this weekend. The event at Finsbury Park will also feature different buses from the past century from the 1020s to the modern day Routemaster. Bond Street - station has re-opened following a short closure due to a fire alert. 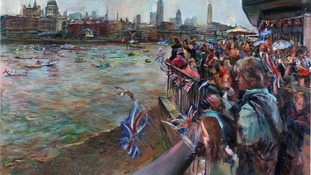 A year on from the Thames Diamond Jubilee River Pageant, over 50 works of art created along the route have gone on public display. The Royal Family criss-crossed the globe, at a cost of almost £1 million, to celebrate the Queen's Diamond Jubilee last year. While the Queen and the Duke of Edinburgh remained at home, touring the UK, their family travelled around the Commonwealth to mark the milestone. The Princess Royal visited South Africa and Mozambique to celebrate her mother's 60-year reign, travelling on a scheduled long-haul return flight between London and Johannesburg costing just over £42,000. For the opening of the Paralympic Games a month later, the Queen flew by chartered plane from Scotland to London at a cost of £16,000, then returned on the Royal Train for £20,000. Regent Street revealed a spectacular display of purple and gold flags in celebration of the 60th Anniversary of the Coronation of Queen Elizabeth II today. Londoners and visitors received a wonderful surprise this morning when they arrived on Regent Street. A total of 189 purple flags featuring gold crowns now span the length of the street to St James’s. Martin Stew reports on the new painting which has been unveiled today on the very spot the coronation took place. Australian born, London based artist Ralph Heimans explains how he worked with the Queen during their meeting to get the right mood for the piece. Ralph Heimans' portrait of Her Majesty The Queen, depicted standing on the Cosmati pavement in Westminster Abbey, will go on public display for the first time in London as part of the Abbey's celebrations for the 60th anniversary of her coronation. In a rare act of acquisition, Westminster Abbey has acquired the painting: The Coronation Theatre: Portrait of Her Majesty Queen Elizabeth II by the Australian-born London-based artist. The painting was the only official portrait of The Queen unveiled during the Diamond Jubilee Year and has to date only be shown at the National Portrait Gallery of Australia, Canberra. It will be on display from 2pm today until Friday 27th September. The ambitious and large-scale, 9 x 11ft, painting depicts The Queen in a unique and highly symbolic setting - the Sacrarium of Westminster Abbey, sometimes described as The Coronation Theatre. It is an imagined scene set at night in Westminster Abbey showing The Queen in a moment of solitary reflection, standing on an exceptional representation of the intricate mosaic patterns of the 13th century Cosmati pavement. The Queen is pictured wearing State Dress, including the crimson velvet Robe of State, which she wore to Her Coronation on 2nd June 1953. The 2013 parade will commemorate a momentous year that saw London host the Olympic and Paralympic Games and the Queen's Diamond Jubilee. The birthplace of the Queen is to be honoured with the Westminster City Council's 100th Green Plaque. Queen Elizabeth was born at Bruton Street in London in 1926. The building is now an office. The Green Plaque is one of the ways the local authority is marking Her Majesty's Diamond Jubilee. The plaques recognise people who have made lasting contributions to society. The first one marked the life of Sir Winston Churchill. Other people whose lives have been highlighted by the honour, include Jane Austen, Oscar Wilde, Sir Arthur Conan Doyle, Edward Elgar, Jeremy Bentham and the Bee Gees. 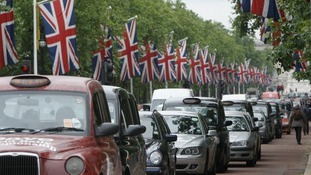 Jubilee weather - will it rain on the Queen's parade?